Interlaken in Switzerland offers some spectacular scenery. WE blew the budget in Interlaken. And we couldn't be happier. That's because once-in-a-lifetime opportunities are priceless. And believe me, Interlaken is the gateway to many. Everything seems on a grand scale here. The lakes - Brienz and Thun - are a magnificent turquoise. You want mountains? You're surrounded. 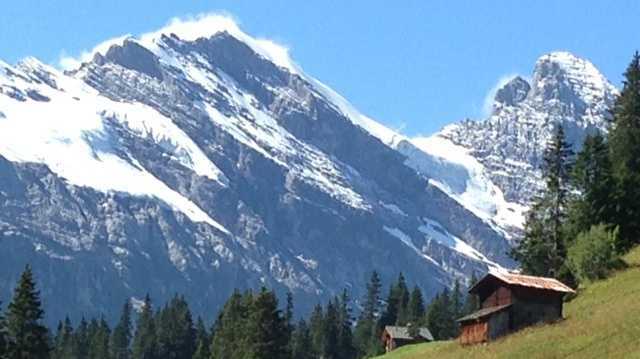 Take your pick of world-famous names including Eiger (3970m), Monch (4099m), Schilthorn or Jungfrau (meaning "virgin snow peak" - the second-highest at 4158m after Finsteraarhorn at 4274m). You want to play James Bond for a day? The revolving restaurant at Schilthorn was immortalised by 007 James Bond. It has a 360-degree panorama and the longest cableway in the Alpine region. With the help of the Swiss alpine railway and cablecar system, we had two glorious days on the mountains that had us begging for more. Day 1 from Interlaken Ost (East) station took us to the green "Heidi" valley around Lauterbrunnen before the quintessential Swiss Alps village of Murren (1634m) for drinks at the Bellevue Hotel and a leisurely walk around town. Next came the thrill of dropping almost 767 metres in five minutes on the Luftseilbahn Stechelberg-Mürren-Schilthorn (LSMS) cableway to Stechelberg (867m), followed by the engrossing sight of 10 glacier waterfalls meeting in one spot to produce 20,000 litres per second of water at Trummelbach Falls (all illuminated and made accessible with the help of a tunnel lift through the limestone and lots of stairs). Day 2 from Interlarken Ost was the piece de resistence: Jungfraujoch - at 3454m, the highest-altitude rail station in Europe, at the top end of the Jungfrau railway (joch means "pass"). Seven kilometres of the 9.3km line are in a tunnel that was hewn in the rock of the Eiger and Monch mountains. The railway's construction over 16 years from 1896 to the official opening on August 1, 1912, was truly one of the world's wonders of railway technology - the vision of A. Adolf Guyer-Zeller in an 1893 pencil sketch. He died in 1899 before seeing it completed but his sons continued on with his legacy. The cogwheel railway climbs the 1400 metres height difference from Kleine Scheidegg to the Jungfraujoch - Top of Europe in 50 minutes. While there, we took advantage of the free "tours" including a 45-minute (make that an hour uphill and about 30 minutes downhill for the return trip) snow walk to Mönchsjoch Hut, a stroll through the sculptures inside the Ice Palace, and the Sphinx Terrace snow fun as well as pictorial and audio-visual displays. The rail trip itself is a photographers' heaven, with windows able to be pushed down, allowing for uninterrupted shots of the charming villages such as Wengen along the way.The mountains are so close, they seem close enough to touch the summits. Even more big-view moments awaited in the afternoon while relaxing at Kleine Scheidegg (2061m) and Grindelwald (1034m). We have never really been "snow dogs" but we had a howling good time in the Bernese Alps, even in summer. Lesson of the day: Travel improves geography knowledge out of sight.